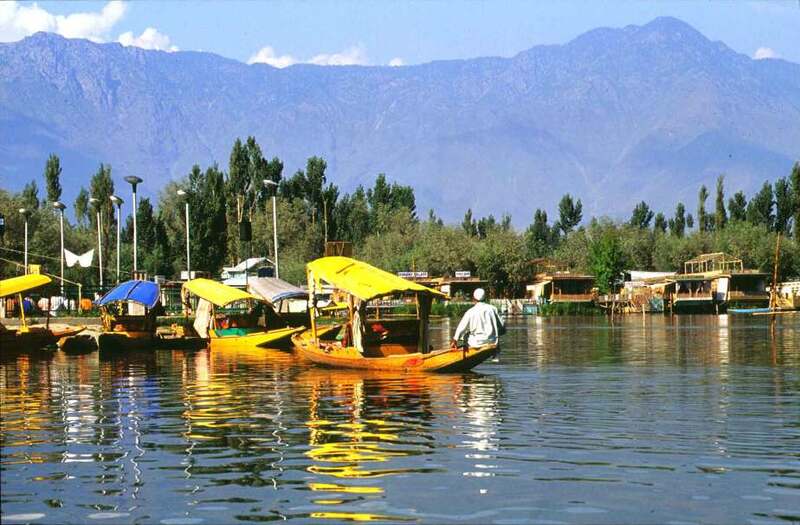 Srinagar… famous as the city of the Dal Lake is also the capital of the state. Situated at 1730 meters above the sea level, the uniqueness of this city are its lakes and the house boats and shikaras swinging on the water. The origin of Srinagar is said to be Srinagari founded by Emperor Ashok in 3rd century B.C. The great Buddhist scholar from China also has written about Srinagari, as a beautiful city in the northern most part of India. A city of mixed cultures. The Hindus, the Muslims and the Buddhist cultures co-existed peacefully in the valley. The British made their impact in the valley by building the houseboats that swing on the Dal Lake even today and are a major attraction of the tourists coming to Srinagar. These varied cultures have given birth to one unique culture that is Kashmiri. Srinagar takes pride on that culture. The beauty of Srinagar is changes daily. In spring when the flowers are in full bloom as if the whole valley is a bed of flowers while in peak winters the white snow just shows the green pine tree tops. As the leaves fall in autumn the whole of Srinagar wears a red - orange look which enhances its beauty. The beautiful Mughal Gardens and long stretches of various lakes, gives the city a unique impact. Be it a ride in the Shikara, a stay at the houseboat, a visit to a temple or a mosque, the beautiful site of flowers beds, or ladies in Burkhas and men folk chatting over the Kahwa, Srinagar holds a beautiful surprise at every turn that leaves you enchanted. Location: Situated in the north western part of this huge state, Srinagar has all the conducive elements to make it a picture perfect. Located in the heart of Kashmir valley and perched at the height of 1730, meters, Srinagar is surrounded by the beauty of Himalayas and nature. Climate: Srinagar experiences all the climatic conditions. A beautiful spring and a pleasant summer, the crisp autumn and the chilly winter. Each weather comes with its own charm and is equally enjoyable. Importance:The summer capital of the sate and known as Paradise on earth. The Jama Masjid is the largest mosque in Kashmir built originally by the Sultan Sikandar in 1400 A.D. Later it was added by his son. But the mosque was gutted down in fire not once but thrice and was rebuilt each time. But the massive original pillars made of pine wood were amazingly saved from fire and they still stand intact and look as good as new. The mosque is huge enough to accommodate 10,000 namazis at one time. The Hari Parbat fort on top of the Sharika Hills is an ancient Hindu holy site. The wall around the hill along with almond orchards, which bloom in spring, was built by the great Mughal emperor Akbar in the late 16th century. The fort above was added by the afghan governor Atta Mohammad Khan in the 18th century. Today it is occupied by the Indian military. 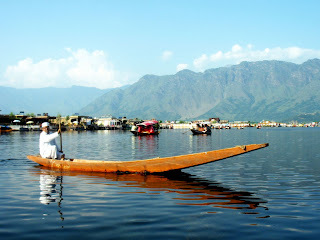 The most famous lake of the town is the Dal Lake. 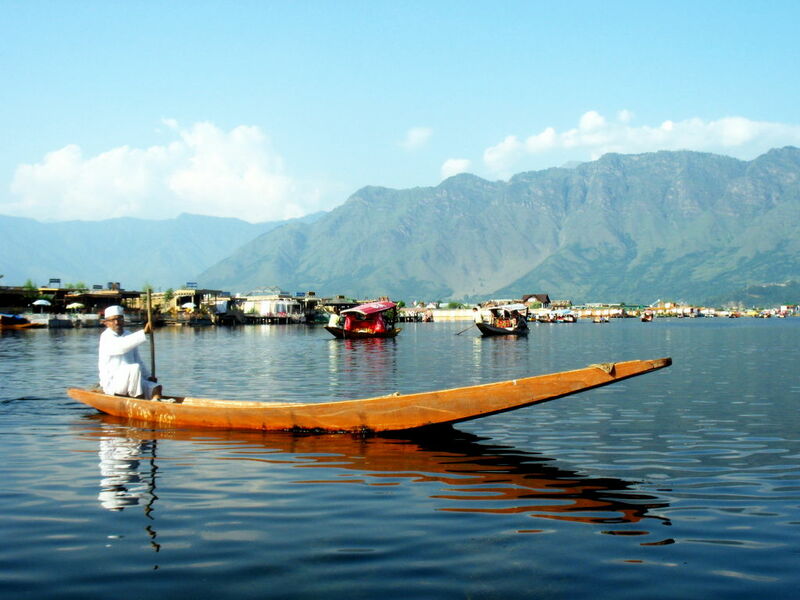 It is not only famous for its slow flow of waters but the beautiful shikaras those row down the Lake with virtually carrying the whole town inside it. 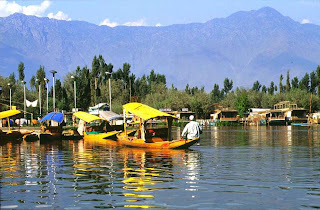 It is located centrally in the town and has many shikaras which give rides to the tourists on the lake. The floating garden and the market here are the prime attractions. Virtually a whole garden is seen floating with various kinds of flowers from roses to lilies and lotus to marigold. Equally alluring is the market where one can buy almost everything. The attraction is that buying, selling and bargaining is done while sitting in the boats and paddling by oars at the same time! The ride in these shikaras can be relaxing and tiring both at the same time. Srinagar has beautiful gardens. Gardens with step terraces, laden with flowers during spring and autumn, water fountains always sprinkling drops of water all around and the lush green surroundings with a carpet of soft grass beautiful trees, including the Chinar. The se gardens were actually developed by the Mughals who were attracted to this place during the long summers of the northern plains. They planted these gardens in a beautiful ambience with great weather. The gardens brought sweet smell of flowers and chirping of birds. What different than this would the Paradise be, they thought! The smallest of all the Mughal gardens but also the most beautiful of all is the Chesmeshahi. Built at a height above the city, it gives magnificent views. Equally stupendous is its layout with just three terraces in addition to a natural spring of water enclosed in a stone pavilion.The Nishat Garden encircles the Dal Lake and is along the road. It was built by empress Noor Jehan's brother, Asaf Khan. Nishat Garden is the biggest of all. 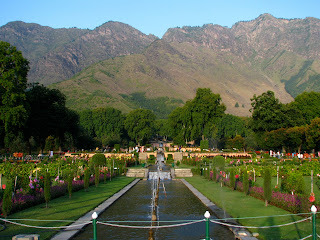 It has several terraces, a central water course and a beautiful site between the Dal Lake and the Zabarwan Hills.The majestic Shalimar Garden was planted by the emperor Jehangir himself. Jehangir is said to have loved Kashmir and Srinagar especially. The Shalimar Garden is full of beautiful Chinar trees and a series of water flowing stone pavilions. The bright flower beds when in full bloom give an exotic touch to the pretty garden. This beautiful mosque built recently stands on the old site and is only one of its kinds in the valley of Srinagar. The earlier mosque was supposed to be 600 years old. It is an elegant structure of white marble with perfectly proportioned single dome façade and a single minaret. It is a typical Kashmiri architecture with cone shaped dome and overlapping terraces and the building is only compared to the magnificent Taj Mahal of Agra. The importance of this mosque lies in the single hair of the Great Prophet Mohammed that is enshrined here. It is opened for public viewing only once a year in the month of July for a few days.